Charming, romantic, ancient, beautiful are just a few of the adjectives used when describing Malá Strana, the oldest quarter in Prague. The cobbled streets in this part of town are smaller and narrower than elsewhere in the city. They retain the charm and atmosphere of a city from the 16th, 17th or 18th century. Horses and handsome cabs can still be seen, intermingled among trams and cars. There is no finer quarter for beautiful buildings, wonderful restaurants and access to the main tourist attractions. We were dreading the traffic in old town Prague, but arriving to the apartment was not bad at all. The location of this flat is great, very close to great restaurants and cafes, as well as the Lennon Wall, the Church of the Infant of Prague, the castle, cathedral and St. Charles bridge, and more. The location also feels very safe as it's in the middle of several embassies. The ceilings of the apartment are beautiful and it was so nice to spread out and feel at home during our visit. The location also feels very safe as it's in the middle of several embassies. We walked across the St. Charles bridge every day to explore the city and we took the tram as well. We decided not to drive anywhere as it really was not necessary. The city is very walkable, as well as great public transportation. Our host Jara was very communicative and helpful too. He helped us purchase a parking pass upon arrival. Overall, we loved our stay here and would book this place again the next time we come to Prague. Thank you Lisa, for your very thoughtful review. We're really pleased that you enjoyed your stay in our much loved apartment and that you had a great time in this magnificent city. You did exactly the right thing in exploring Prague by foot, it is by far the best way to experience the historic and beautiful sights. You were ideal guests and it was a real pleasure to have you stay. You will be very welcome to stay here, or in any of our other apartments or boats. Place is nice. The location you can’t beat. The owner was very accommodating and promptly responded. They even arrange our pick up at the airport and drop off to the train station. Many thanks for your kind comments Ivan, it was a real pleasure to host you and your friends. You will be very welcome to stay again in any of our apartments - or boats! Thank you Karim, we are really pleased that you enjoyed your stay in our lovely apartment Vlasska 6. We do our very best to make our apartments as comfortable and welcoming as possible, enabling our guests to relax and giving them the best possible base from which to experience the many pleasures of our beautiful Prague. You were perfect guests and we would be delighted to welcome you back here to stay in any of our apartments, or boats. I was having difficulty connecting with the owner and had to contact VRBO. The property manager sent an email with key details, etc. and was, actually, at the property to greet us and let us in. Once settled, we noticed rice on the counter top, as well as some chopped vegetable or fruit behind the kitchen faucet. There was hair in the shower. To be honest, we’ve never had this happen to us. Because it was extremely hot, there were three fans, two worked. I sent a note and didn’t hear back for a day and a half, but when we got back to the property, a new fan was there. The street is very loud at night and, despite a two bathroom description, there is only one toilet. That being said, this is a great location. The owner was extremely easy to work with and eve arranged rides for us from the airport. We loved the location, within an easy walk to all the major sites. It was so nice to have a washer/dryer, full kitchen, and 2 bedrooms and bathrooms. Will definitely stay here again in the future! 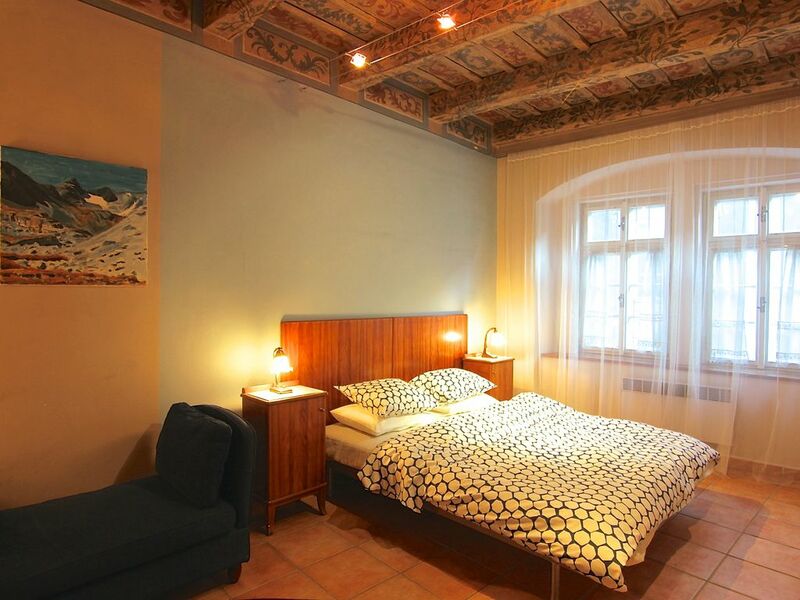 This apartment is wonderfully located in Mala Strana away from all the chaos of Old Town. It's a very short walk to Charles Bridge and the river, as well as to several walking routes up to the palace or Petin Hill. Inside, the rooms have a lot of character and are very comfortable. For Americans there will be a shortage of closet space for hanging clothes but for anyone who sees that as a big problem, they may be focused on the wrong things. You're in Prague in a modernized apartment! This is the fourth apartment I've stayed at on trips to Prague, and this most certainly is one of the best. Many thanks Mark, for your lovely words. You were ideal guests and we would be very happy to welcome you back to stay in any of our apartments, on your future visits to Prague.